A white flag flies beneath the American flag at the John Evans Alumni Center in commemoration of the 151st anniversary of the Sand Creek Massacre Saturday morning. The Northwestern Native American and Indigenous Student Alliance launched a petition to rename the alumni center Saturday during the final event of this year’s MSA Native American Heritage month. 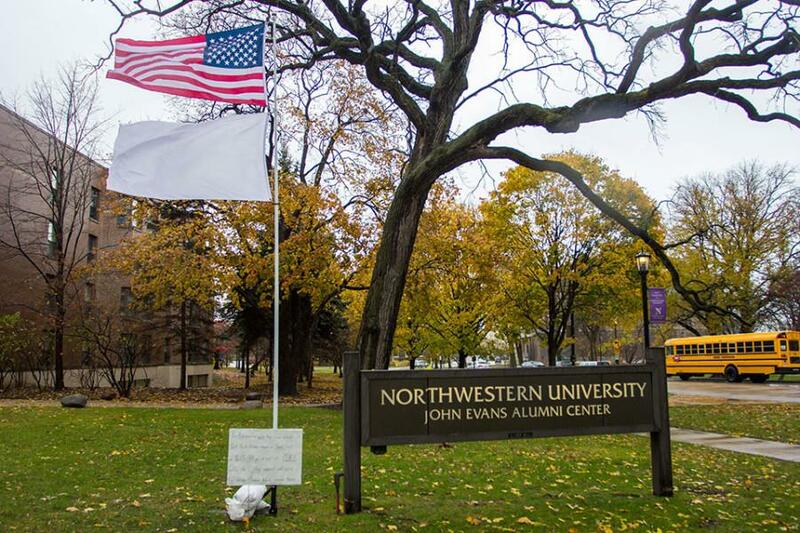 Members of the Native American and Indigenous Student Alliance launched a petition Saturday morning asking administrators to remove University founder John Evans’ name from buildings including the John Evans Alumni Center. The student alliance made the announcement at the commemoration of the 151st anniversary of the Sand Creek Massacre, held Saturday in Norris University Center’s Dittmar Gallery. The petition also requests the University remove Evans’ name from faculty positions such as the John Evans Professor of Moral and Intellectual Philosophy. SESP senior Forrest Bruce, co-president of NAISA, said there is no deadline or threshold for the amount of people who sign the petition. During the event, Lesley-Ann Brown-Henderson, executive director of Campus Inclusion and Community, announced Jasmine Gurneau, a member of the Chicago American Indian Community Collaborative, will assume the position of assistant director of Multicultural Student Affairs and Admissions, a joint position within the Undergraduate Admissions office and MSA. “She would be helping to recruit, develop and support Native American students and leading identity engagement initiatives for MSA,” MSA director Charles Kellom told The Daily. Brown-Henderson said Gurneau will begin working at NU in early December. During the commemoration event, Brown-Henderson spoke on the significance of history. “The more that we can acknowledge our history as a university, particularly to marginalized communities, the greater we can be as an institution,” she said. Mark Cleveland (Weinberg ‘87) acknowledged the work by NU community leaders to begin a conversation about changing the names of certain University spaces to make NU a safe space for Native American students. He also recognized NAISA members’ efforts. “I want to thank these young men and women for asking us what the legacy we want to leave behind is and the respectful way that they’ve done it,” he said. Before the event at Norris University Center, NAISA students and community members raised a white flag over the Alumni Center in memory of the white flag chiefs Black Kettle and White Antelope raised near Fort Lyon, in Colorado, as a symbol of peace to establish themselves as friendly before U.S. troops. On Nov. 29, 1864, Colonel John Chivington attacked this Native American camp near Fort Lyon, killing more than 100 Native Americans. NU formed the John Evans Study Committee in 2013 to investigate Evans’ connection to the Sand Creek Massacre. The Native American Outreach and Inclusion Task Force was created the next year to study Northwestern’s ties to the Native American community. In May 2014, the Study Committee found no evidence Evans, NU founder and governor of the Colorado territory at the time of Chivington’s attack, was directly involved in planning the Sand Creek Massacre. However, the committee said Evans did have some responsibility in an attack that killed about 150 Cheyenne and Arapaho people. Lorenzo Gudino, NAISA’s treasurer, helped raise the white flag Saturday morning. The Medill junior said he was happy with the event’s turnout, especially because the ceremony had to be moved from outside the Alumni Center to Norris because of the weather.